Get ready for an exciting and educational tour of Cleveland, Ohio! From cultural education at the Rock and Roll Hall of Fame to scientific discoveries at the Great Lakes Science Center, this tour will teach you everything you need to know about Cleveland and everything it has to offer! Take in the entertainment sites of the Christmas Story House, learn about the influential women pilots of the past at the International Women’s Air and Space Museum, stop and smell the ecologically educational roses at the Botanical Garden, or just spend some quality time shopping and immersing yourself into Little Italy! This trip is made just for you and your group and has plenty of opportunities for fun, all you have to do is decide when you’re coming! A Christmas Story House and Museum - Don’t miss a chance to stop at this local Cleveland gem, the ‘A Christmas Story’ House and Museum. This movie madness inspired home has been fully restored to its same exact movie splendor from the 1983 classic holiday film and hosts regular tours and guests visits. A super fan of the movie, Brian Jones, decided to buy this 19th century Victorian home for $150,000 and remodel it fully for another $240,000. The funds he used to complete the project were from his ‘Red Rider Leg Lamp’ Company, a venture still fully in business today at the gift shop across the street! Any fans of entertainment or holiday fun will love this stop, with a chance to see authentic props, costumes, and behind the scenes memorabilia in the museum across the street from the house. Guests can see toys from the Higbee window, Randy’s snowsuit, Randy’s bunny suit, the classroom chalkboard, and the family car from the film. And don’t worry, you can actually touch everything in this museum, they actually encourage it! Over 5,000 guests came to the opening weekend of this cinematic neighborhood venture, including the cast of the movie themselves. Keep your eyes open for more celebrity visits and famous leg lamp gifts, and for God Sake’s Ralphie don’t shoot your eye out! Rock and Roll Hall of Fame and Museum - Rock out like Jimi Hendrix and the Beatles at your next stop in Cleveland, the Rock and Roll Hall of Fame and Museum. This 55,000 square foot museum, store, and cafe opened in 1995 and has since seen 8.5 million visitors walk through its iconic glass doors. 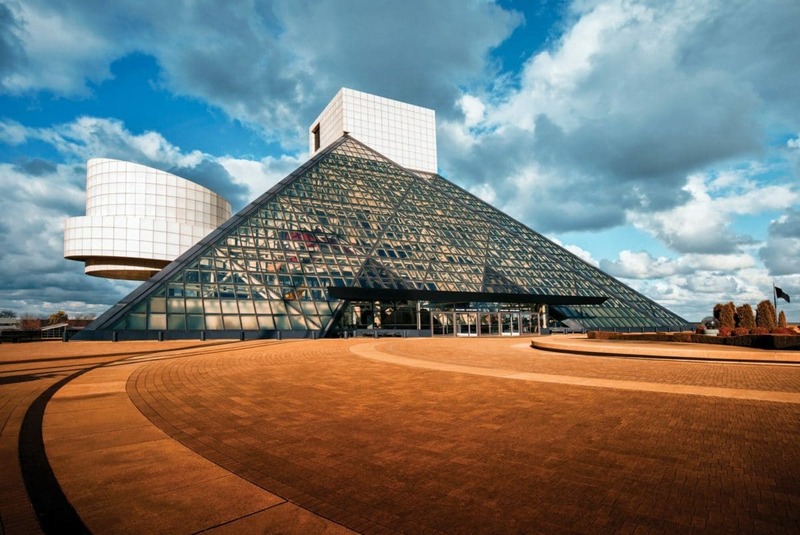 Considered a local landmark, this museum sits on the shore of Lake Erie near downtown Cleveland and houses 7 floors of different media exhibits that work to preserve and interpret the impact rock has made on the world thus far. The building itself is an architectural feat, a series of dramatic geometric forms and dynamic cantilevered spaces that are anchored by a 162-foot tower leading into the large triangular glass tent that will leave a lasting impression in your mind for sure. While you’re here be sure to check out the Beatles exhibit or the Cities and Sounds display, mapping out the history and impact of different rock Gods and Goddesses throughout the world. Explore all 7 floors of the exhibits, archives, and educational programs archiving the history of the best-known artists, producers, and engineers before heading over to the cafe for an Elvis themed peanut butter and banana sandwich, the perfect way to end this rock and roll experience! Great Lakes Science Center - Get ready for an exciting hands-on, minds-on experience at the Great Lakes Science Center! Within this large learning facility, your group will have the chance to see and touch hundreds of hands-on exhibits, see live science shows, science demos, and visit the omnimax theater, cafe, and Science Store. The amount of activities to do inside seems endless, so why not start with a visit to the NASA Glenn Visitor Center to view the Apollo Command Center. You can also see the Great Lakes Freighter William G Mather, the 618 foot 1925 steamboat, visit the Polymer Funhouse, Learn about genomics and infectious diseases in the BioMed Tech Gallery, or just relax in the 6-story Cleveland Clinic Omnimax Theater. Explore the science of light, magnetism, solar energy, DNA, or go touch the Indoor Tornado created daily! After your group has had their fill of science be sure to grab a book or game from the Science Store or sit down for a delicious burger or salad at the on-site Science Cafe. International Women’s Air and Space Museum - Welcome to the International Women’s Air and Space Museum, a facility created in 1998 at the terminal of Burke Lakefront Airport. This historical and educational destination is just seconds from the Science Center and Rock and Roll Hall of Fame, so don’t feel rushed to get here! The purpose of this museum is to preserve the history of women in aviation and educate about their impact in the world of aircraft. The museum is filled with aviation memorabilia and historical artifacts, such as photos, textiles, artwork, and articles pertaining to these women and their craft. Most of the artifacts have actually come from a group of women called the Ninety-Nines, a club started back in 1929. These 99 women, led by Amelia Earhart took pride in their international pilot club and many of the club's contributions can be seen in the museum today. Your group will learn about Sally Ride, Bessie Coleman, Jackie Cochran, Amelia Earhart, and many other influential female pilots! Coventry Village -Coventry Village is the premier location for shopping, dining, and fun-loving hippies in Cleveland Heights, Ohio. This diverse community is full of eclectic eateries and shops that cater to every personality type, both the young and old, the peaceful or the punk! Stroll around this neighborhood and you’ll find art supplies, vintage toys, books, Birkenstocks, coffee shops galore, and a wide selection of vegetarian food! In the mornings Coventry Village is known for their amazing and healthy breakfasts, book store shopping, and dog walking opportunities along the street. The afternoon brings the lunch and shopping hustle and bustle, and the evenings are full of music, entertainment, and more fine dining than before! Nightly activities in this community are always interesting and upbeat and currently include open mic nights, Peace Park poetry readings, or Indian style belly dancing classes! Your group will love the fun themed niche shops, just be sure to bring a camera to catch a wacky Coventry Village moment on film! University Circle - Start your second day of Cleveland adventures at University Circle, the premier urban district and world-class center of education, medical, and cultural institutions. A mere 4 miles from downtown Cleveland and situated next to the historic Euclid Corridor, this massive city block is the only location you will be able to find education, health care, art, culture, religious services, and social services all in one! Anchored by the University and hospital, this myriad of residences, restaurants, and retailers is the fastest growing employment center in Northeast Ohio. The block includes the Cleveland Museum of Art, Cleveland Orchestra, Contemporary Art Institute, and Cleveland Institute of Music. Your group can also take a stroll down Juniper or Magnolia lanes to see the sites where 19th-century mansions and carriage houses were converted into boutique hotels, shops, and eateries. Check out the modern arts and culture district, Botanical Garden, or Wade Park! Every member of your group will find something they enjoy doing here at University Circle, that’s a guarantee! Cleveland Botanical Garden - Your next stop is located within University Circle and features 20 unique, ever-changing, and visually stunning gardens! Created in the 1930’s, the Cleveland Botanical Garden is home to ten acres of outdoor gardens, an impressive climate controlled biome dome, 15 times and location themed gardens, and the on-site Garden Cafe. Perhaps the most visited and talked about feature in the Garden is the Eleanor Armstrong Glasshouse, an 18,000 square foot encased biome mimicking that of the Costa Rican Rainforest on one side and the Madagascar Spiny Desert on the other. Within the structure you will see several species living naturally, such as butterflies, birds, reptiles, and amphibians, as well as some very unique plants such as the colossal fig, upside down baobabs, or hard to pronounce pachypodiums! Your group will also be able to admire the ornamental trees, shrubs, and hardy perennials of the woody boardwalk and relaxing sounds of trickling water paired with the feel of mosses, sedum, and the scent of lavender at the Elizabeth and Nona Evans Restorative Garden. No matter the season your group is going to enjoy the vibrant spring bulbs, colorful summer annuals, and spectacular colors of fall foliage. Stop by the Garden Cafe for a refreshing smoothie or quick lunch while you are here too! Western Reserve Historical Society - The Western Reserve Historical Society is the oldest existing cultural institute in Ohio, created in May of 1867 and maintained to perfection since then! This reserve was originally created as a historical branch of the Cleveland Library Association and has since then aimed its focus toward the preservation of documents and objects relating to national, regional, and local history. Today this institution focuses primarily on Northeast Ohio and 19th-century life. While you are here you will have the opportunity to explore Hale Farm and Village, an old farm homestead complete with active work animals and heritage gardens, the History Center, or the Outdoor Living Museum. Inside the Hale Farm, you can watch cooking demos, learn about the trades of the time, or partake in period-appropriate crafts. The History Center is home to the Crawford Auto-Aviation Museum, offering a unique opportunity to see the history of every type of transportation from horse-drawn carriage to seafaring ferries! This location is a great opportunity for your group to learn about the history of Cleveland, Northeast Ohio, and 19th century living in general! Museum of Contemporary Art Cleveland -The Museum of Contemporary Art in Cleveland, or MOCA Cleveland, is Ohio’s only contemporary art institute and was created in 1968. Over the last 45 years, MOCA Cleveland has played an ‘urgent and exciting role in Cleveland's cultural landscape. To keep up with the times MOCA introduces new exhibits 3 times a year, offering fresh seasonal art experiences for locals and guests alike. Some of the first exhibits featured in the MOCA Cleveland includes works from Jasper Johns, Christo, and even Andy Warhol. One of the most impressive parts of this location is the building itself, though, designed by Moussavi as his first major architectural success. Created to be environmentally and fiscally sustainable, this inventive, stunning, and practical 4-story building features 34,000 square feet of exhibits, a six-sided base, 4-sided top, and reflective black stainless steel geothermal siding. This geometric wonderland offers various resources, activities, art projects, and nightly classes to promote education and community outreach. Currently, at the museum, you can enjoy the popular exhibit “Remaining Human” or wait patiently for the upcoming “Off the Ruling Class” Yitzhak exhibit. Regardless of what is on display when you visit, your group will be visually and architecturally stunned after a tour of MOCA Cleveland! Little Italy - End your two-day Cleveland adventure at the very site that Joseph Carabelli created an Italian sculpture, and entire Italian village, right here in Ohio! The area boasts over 20 art galleries, 15 authentic restaurants, several professional businesses, 2 schools, and the Holy Rosary Church. With a location directly adjacent to University Circle, this spot is easy to find and even easier to spend your day in! While you are here you must try an authentic meal, perhaps from Angelo’s Nido Italia or Valerio’s Place, both offering homemade pasta, cannoli, and gelato! Shopping here is an exciting adventure as well, be sure to stop by the Spuzzillo or Venetian Merchant Markets to pick up your authentic foods, books, and souvenirs from Italy! This historical and cultural district also offers daily and seasonal events, such as art walks, wine tasting, live entertainment, and the famous annual Feast of Assumption, Columbus Day Parade, and Affresco Festival. Your group will really feel like part of the community after spending a little time in Little Italy, and you’re going to feel like you just walked the streets of Europe after the authentic shopping and dining experiences you had the opportunity to do in Italy (Cleveland)!